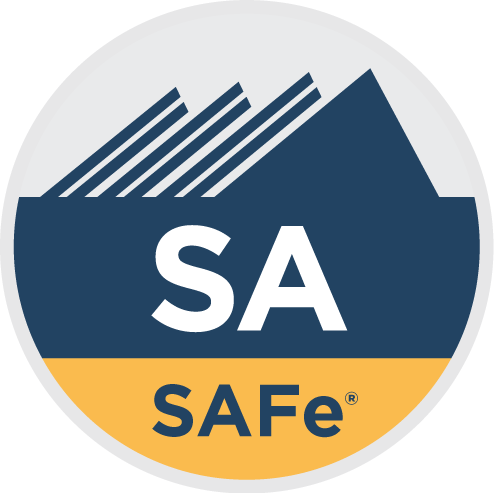 Leading SAFe 4.0 with SA Certification: In this two-day course you will learn the Lean-Agile principles and practices of the Scaled Agile Framework® (SAFe®). Through engaging lectures, real-world examples, and insights from SAFe experts,ou’ll learn how to execute and release value through Agile Release Trains, how to build an Agile Portfolio, and how to lead a Lean-Agile transformation at enterprise scale. You will gain an understanding of the Lean-Agile mindset and how to apply the principles and practices of SAFe to support Agile teams, programs, program portfolio management, and to coordinate large Value Streams. Upon course completion, you will be eligible to take the test for the SAFe Agilist (SA) certiﬁcation. The SAFe Agilist certification program is for executives, managers and Agile change agents responsible for leading a Lean-Agile change initiative in a large enterprise. SAFe or what is commonly regarded as the Scaled Agile Framework, is a way of scaling agile designed for larger organizations or projects. Scrum, which is the most popular agile transformation that is used in small projects and teams may not fit a company that is developing a complex software or a project that results in a product. SAFe makes it possible for agile methods to work at enterprise level. As a system, it is important to understand the Scaled Agile Framework since it gives organizations the guidelines they need to develop complex or large software. Any organization or individual that is planning to utilize agile needs to incorporate SAFe and the certification program provides a better understanding of the framework. SAFe Certification will equip you with the tools and knowledge required to be effective at applying scaled agile methods in your business context. You will gain adequate knowledge to be able to be effective at each of the critical levels in a scaled agile framework. That is, SAFe certification helps you better understand your roles and be effective at Team, Program or Portolio level of the framework. SAFe certification is for professionals who want to acquire proven knowledge in order to apply scaled agile framework and develop software or products in an effective manner. It is a suitable training for executives, managers and agile change agents with a keen interest in learning the development flow principles that they can apply in their context. Learn Agile principles and practices so as to execute and release value for the organization. SAFe is a course that is ideal to every member in an Agile team. However, the certification is more targeted to those who play a leading role in adopting and scaling lean and agile principles at enterprise level. Explain how Lean, Agile and product development flow are core areas of SAFe framework. Should an enterprise decide to rollout SAFe, it is important for members to understand the underlying principles of Agile, lean thinking and product development. ANS provides adequate training to help individuals and teams become certified SAFe professionals. Upon successful completion of the SAFe training course, an individual will be well equipped to prepare for the SAFe Agilist certification exams.